De l’ex-Yougoslavie au Soudan, du Proche-Orient au Cambodge, la question de l’intervention de la justice internationale se pose désormais à chaque conflit, suscitant immanquablement de virulentes controverses. Deux thèses s’affrontent: les uns ne voient dans cette justice qu’une arme utilisée ou délaissée par les gouvernements selon leurs intérêts du moment; d’autres considèrent au contraire la lutte contre l’impunité comme le socle d’un Etat de droit et d’une société démocratique. La justice est-elle un obstacle ou une condition à la paix? Est-elle indispensable pour reconstruire des sociétés et rétablir une paix durable? 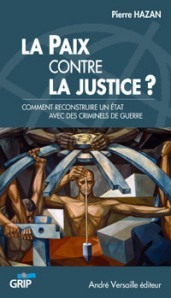 A travers des cas concrets (ex-Yougoslavie, Libéria, Soudan, Liban…), Pierre Hazan analyse les effets de cette nouvelle diplomatie judiciaire. The Nuclear Alternative and its Effects. Within IR theory, the literature on deterrence, the one dealing with proliferation and finally the one dealing with disarmament are intuitively connected but this link is rarely stated clearly or explicitly. I posit here that “extended nuclear deterrence” is an interesting starting point to examine this nexus. Extended nuclear deterrence plays an important role in the narrative of the Cold War as nuclear peace. This paper will argue it is also a cornerstone of the narrative of nuclear history as proliferation history through what I label the “nuclear alternative” and will assess this alternative. The nuclear alternative can be stated as follows: either a protector provides a nuclear security guarantee to its ally/ies or it/they will get his/their own nuclear weapons. First, the paper will provide an assessment of extended deterrence as a non-proliferation tool based on comparative case studies, showing that it has neither been a necessary nor a sufficient condition for nonproliferation, which invalidates the notion of nuclear alternative. Second, using sociology of knowledge, it will analyze the “good reasons” (Boudon) to believe in such an alternative and debunks their implicit and faulty assumptions. The credibility problem emphasized in the literature on deterrence will therefore not appear as the only reason why the alternative is not valid. Third, the paper will expose the contemporary effects of such a view of history on the possibility of downsizing the US nuclear arsenal and on what is considered as proliferation.